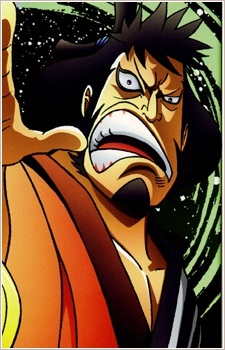 Foxfire Kinemon is a samurai from Wano Country whom the Straw Hat Pirates found in various pieces at Punk Hazard. Kinemon seems to follow the code of bushido, claiming he would commit suicide if he could, for the disgrace of being dismembered without dying. He still tried to maintain his pride, even after being completely dismembered. He is also greatly honorable, such as bowing before Sanji (in Nami's body) for saving his torso and thanking him for helping him stating he was indebted to him. He is a very old fashioned samurai warrior who expects women to walk three steps behind men and talk gracefully and quietly. He on many occasions referred to Nami as a shameless, violent and obscene woman due to her careless behavior. He felt disgraced when he got hit from Nami on his head. It is not yet confirmed if this is the traditional code of Wano Country or if it is his personal expectations of women. He has a tendency to be quite perverted in spite of his old fashioned ideals. Though he seemed to be outraged at Nami's sense of fashion, he still greatly enjoyed ogling at her cleavage. He also has an extremely rude special ability of talking with his farts. He cares deeply for his son, Momonosuke, as he traveled to the dangerous Punk Hazard island and challenged one of the Shichibukai to find him. Even after being chopped to pieces, his torso and leg still attempted to look for his son, and attacked anything that got in the way. He seems to be unaware of Devil Fruits, as he said he ate a strange fruit, instead of stating the correct name. This article looks details a range of character info about One Piece's Roronoa Zoro. It will provide you with a small glimpse of who 'Pirate Hunter Zoro' is. Below you can find some simple character details including his appearance, skills, personality and relationships with other characters.